teanamu chaya teahouse > teahouse stirrings blog > safely back in London with tea treasures! Two of the fresh green teas that I have brought back with me from China; Pre-Qing Ming harvested Dragonwell (L) and Taiping Houkui (R). They look and taste great despite the bad weather. After being stuck in Beijing for several days because of volcanic ash, I finally made my way back to London 2 days ago! Tired as I am, I am extremely excited to have found many really fresh teas. As I look back on my journey, I realise I was a little bonkers in taking some of the extreme measures I took to protect these precious teas, so anxious was I that they should not overheat or get squashed or damaged! While there was a lot of drama surrounding my flight delays and those of so many other people, I am a lot more affected and touched by the plight of the earthquake victims in Yushu, Qinghai province and the efforts and single-mindedness of ordinary Chinese people in helping the victims of the earthquake. My condolences to them. During this trip I was very honoured to have climbed Da Xue (Big Snow) Mountain in MengKu (Yunnan) to see the 2,800 year old tea tree near the summit (3,300 meters above sea level) – which the ordinary public are not allowed anywhere near (for environmental protection reasons). Pictures of me grinning beside this ‘living antique’ tea tree to follow! I was also very privileged to work with local tea cooperatives to bring back 2010 Spring Harvest Raw Pu Erh tea cakes made from these ancient trees, which are naturally organic, and in fact the cooperative are very keen, I discovered, to work towards earning internationally recognised, official ‘organic’ status. I have also bought back many other Pu Erh tea cakes all harvested from tea trees several hundred years old, and yet so so fresh because the leaves were only picked a few days ago! Raw or ‘Sheng’ Pu Erh teas are typically allowed to vintage and ripen over time to allow their flavours to develop. Pu Erh can also be made to vintage quicker under controlled conditions and is then called Ripened or ‘Shou’ Pu Erh (commonly mistranslated as Cooked Pu Erh). This time I have only managed to find one single 145g Ripened Royal Pu Erh tea cake of 2002 vintage. Both types of Pu Erhs are highly prized and I met many tea connoisseurs on this trip who have made a bomb out of collecting and dealing in! More about this extraordinary trade in later blogs I expect! In addition to these lovely Pu Erhs, I have also managed to bring back with me albeit in very small quantities extremely fresh Dragonwell green tea and Maofeng green tea (two of the top ten teas in China). The ‘slim pickings’ are directly related to the severe cold snap in China earlier this year, which has disrupted supplies and thrown the market into turmoil. 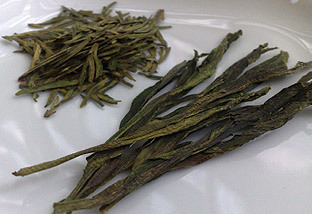 I am also very excited about my personal favourite, Taiping Houkui green tea, as it is ‘one of a kind’ in terms of its shape and taste. I cannot wait to showcase these teas with you at our Spring Tea Open House this Saturday (1 May) from 12-4pm! Hope to see you there!